I have been closely following this year’s elections in Zimbabwe, southern Africa. It was an all-in-one election: on March 29th the people of Zimbabwe went out to vote on the president, the House of Assembly and the senate. For those of you who don’t know, the president of Zimbabwe, Robert Mugabe, ruling for 28 years now, and his Zimbabwe African National Union – Patriotic Front (ZANU-PF) party have been rigging the last few elections and have been in the habit of killing, beating, torturing and displacing the poor, people of and people supporting the opposition party MDC (Movement for Democratic Change) and white farmers. A combination of blatant mismanagement, bad timing (raiding farms and killing and displacing farmers during harvest times) and nepotism (giving the farms seized from the hated “colonial white farmers” to his cronies instead of people who know about farming) and a lot of other things I am surely missing, has led the country into ruin. 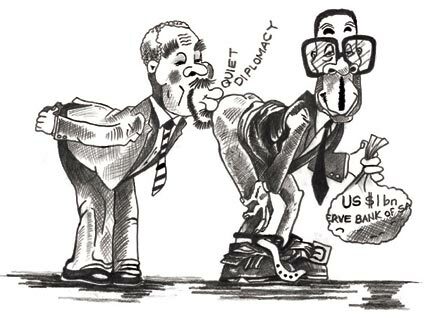 At the time of the election Zimbabwe had an inflation rate of 100,000% (One hundred thousand percent! ); the unemployment rate is at 80%, the most basic food is either unavailable or too expensive for people to buy and the rampant number of HIV infections and an appalling sanitary/hygiene situation have led to the incredible life expectancy of around 34 years for women. If this country and its people are to survive, Mugabe has to go - the sooner, the better. Voting proved to be difficult, in some cases impossible. Voters were turned away from polling stations for various reasons, ranging from alleged additional nationalities which would (unlawfully) exclude them from voting to not being on the list for the polling station they’d been going to all their lives. Some of the voters with the latter problem managed to vote at other stations. The stations themselves were often hidden away from view, as were the posters pointing to them. If you had managed to find a polling station and were on their list of registered voters, you might still have found yourself in the company of a good many intimidating police officers who were present at polling stations “to assist disabled or illiterate people to cast their votes”. After two days of suspence and rumours of Mugabe having fled the country to varying destinations, the Zimbabwe Electoral Commission (ZEC) started releasing results for the House of Assembly votes in a slow and irregular trickle, strangely enough always with ZANU-PF being one or two seats in the lead. 7 seats went to MDC Mutambara (not a wise choice to split the MDC if you ask me…). As of today the other results have not been officially released. Yet Mugabe accuses the MDC and even members of the ZEC (a ZANU-PF controlled institution after all) of vote rigging and has contested part of the House of Assemby votes and the presidential vote. Not only the people of Zimbabwe wonder how he can contest numbers that nobody knows. Some ZEC officials have been arrested. MDC party members and people of the regions that very strongly voted for MDC have been beaten and burned. Houses have been destroyed, more white farmers threatened. Do I have to mention that harvests have been destroyed? For the first time ever the ballots were counted at each polling station right after the elections and the results publicly displayed. Indepentent observers and MDC members photographed those results and counted voters. There are variations in the House of Assembly results but all in all the numbers tally - ZANU-PF votes due to “helpful police officers aiding the disabled and illiterate” notwithstanding. The Independent Results Center webpage of the Parallel Vote Tabulation (PVT) has long since published the results of the presidential vote as well, unofficially declaring Morgan Tsvangirai of the MDC the winner with 50.3% of the votes. The people of Zimbabwe know the results of this year’s elections. Oh, they knew them last time as well, but last time there was no proof. This time there is. The Zimbabweans are desperate and have had enough. The High Court in Zimbabwe rejected the MDC’s demand for an immediate release of the vote count on April 14th. By now a recount (read: rigging) in 23 of the 210 constituencies has begun. Violence, lies (Tsvangirai a puppet of the old colonial masters) and threats have been stepped up. The last time I saw the inflation rate mentioned it was at 164,800%. As in the past during the bouts of violence and oppression following elections in Zimbabwe the South African president Thabo Mbeki stood close to his buddy Mugabe, denying there being any crisis in Zimbabwe, while government spokesman Themba Maseko called the situation dire. 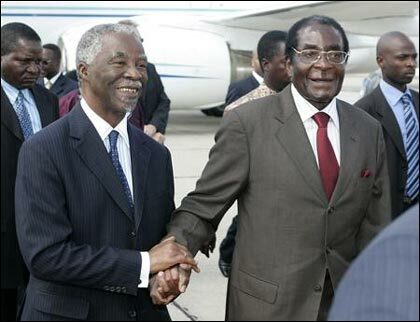 African Development Community (SADC) in Lusaka, Zambia, on the 13th Mbeki made a short detour to Zimbabwe, amiably joked with Mugabe, and then went on to Lusaka to tell everyone there to wait for election results. Although he had first said he would, Mugabe did not grace the summit with his presence but sent his foreign minister instead. Despite the host’s urging the SADC to take action the SADC let themselves be convinced by Mbeki to do nothing. I’ve been wondering for quite some time now why the Olympics are going to happen in China. There were certain conditions that the Chinese government was supposed to stick to in return for the honours, right? Like, paying a bit more attention to human rights and freedom of the press. As nothing seemed to be happening in that direction people started to call for a boykott of the Olympics. So - naturally, in my opinion - more and more people were calling for a boykott of the Olympics. Um. But the Chinese just did everything they weren’t supposed to do. Isn’t the idea of such levers that if “the evil state” doesn’t comply, there will be consequences? Where are the consequences? You can’t just make a press statement condemning what they did and let them go on as they please. Everyone should withdraw from this year’s Olympics. And I don’t just mean politicians attending the event. The athletes should not show up. Or show up, but do no sports and protest. Anything but pretending that some stupid global sports event is more important than human rights. “Ok, very valid reasoning,” you will be saying, “but what is this doing in a post about southern Africa?” Ah, let me enlighten you. On April 14th a Chinese ship, the “An Yue Jiang”, arrived at the port of Durban, South Africa, carrying a shipment of arms for Zimbabwe. On April 15th the presence of Chinese soldiers was reported from Mutare, Zimbabwe. As I said, the “An Yue Jiang” arrived at Durban on the 14th. On April 16th Transnet and National ports authority of South Africa cleared the ship to begin the offloading of arms and ammunition. On April 18th the Anglican bishop Rubin Phillips with the backing of the SA Litigation Centre (SALC) went to the Durban High Court which granted an interim order stating that the shipment of the “An Yue Jiang” would be placed under the curatorship of the Sheriff of the Court, meaning that the court would seize the cargo the moment the ship docked. The world should applaud the SATAWU, the bishop, the SALC and the High Court in Durban for standing up against the official position of their country’s politicians, or - more correctly - the position of Thabo Mbeki. Sadly, the ship is either on its way to Mozambique or Angola now, although it has been registered as a casualty today. Everyone is wondering if it really is in trouble or just pretending - or chancing - to be adrift without fuel in order to force being refuelled. Main source for my information for this article - apart from the news - was the “This is Zimbabwe” blog I am linking to in my blogroll as well. That’s also where I found the pictures I used in this post. There was no source given for the photo, but the cartoon I put in the first South Africa bit seems to be a Sokwanele creation and people are encouraged to use it as an ecard. I wrote to Sokwanele, but I suppose they have more important things on their mind right now than weird German bloggers asking about using their stuff. Until I hear otherwise I will consider this blog post my ecard to you then. The two cartoons I added in the Zimbabwe bit I was allowed to use with kind permission of Zapiro, or rather of the person who answers his emails. The cartoons are perfect for describing the situation regarding the vote counts, so I am truly thankful I was granted permission to use them. You are currently browsing the Melantrys’ Page weblog archives for April, 2008.